It’s not hard to realize that the 2016 season didn’t end precisely the way we may have wanted. Hell, I’m still having trouble believing that it ended at all. That should sink in eventually. In the meantime, the search for truth and meaning continues. However, we’ve got to fill the offseason somehow, not just as a matter of convenience but, at this point, as a matter of mental stability. A few years ago, say prior to 2013, filling the offseason took a backseat. There were the Jets and the Rangers and the Knicks, not to mention all the fun one could get up to in winter, which was liable to make you forget about your Mets once in a while, then notice around February 1st that Pitchers and Catchers was only a few weeks away. I exaggerate, at least in my case: I always knew the countdown to pitchers and catchers, starting as soon as report dates were announced. But the point remains: killing the offseason, for me, didn’t used to be about just killing the offseason. But then 2014 happened, and amidst the emergence of Jacob deGrom, the growth of Zack Wheeler, and the offensive contributions of Murph, Lagares, and Duda, among others, we came out of nowhere to finish second. Now, that doesn’t seem like much. Then, it was everything. The 2014 offseason was my favorite and least favorite that I’d ever been through, for the same reason: I couldn’t wait for our guys to get back out there. And eventually they did, and we all know what happened then. Which made the 2015 offseason even more raucous and excruciating. And now here we are, a disappointing loss having ended a miraculous sprint to the finish line. I’m disappointed, but — I can’t believe I’m typing this non-ironically — not devastated; that we did what we did is nothing short of ridiculous, and around the Mets, ridiculousness is par for the course, but not usually in a positive way. And what’s more, I’m excited beyond belief. We’ll be back and we’ll be better in 2017: I truly believe that. We’ll have our starters, and maybe we’ll have our starters finally healthy for a change; we’ll have Duda, Cabrera, the captain, and Reyes; we’ll have a restored-to-goodness Conforto, Granderson, Bruce, maybe (PLEASE!!!!) Cespedes; we’ll still have Reed and Familia, which even after yesterday should fill you with confidence. I truly do believe that maybe, just maybe, 2017 can be every bit as good as 2016 and 2015 were and maybe even better. But in the meantime, I’m hardly ready to let this 2016 team go, seeing as up until about 16 hours ago, they were the team I thought would defy the odds and bring home a championship. We’ll let them go eventually, but there’s no reason not to hang on to those incredible memories for a few more days. And while we’re at it, there are a few of these 2016 Mets that stood out even beyond the miracle that was the team as a whole; a few I find deserving of extra recognition. 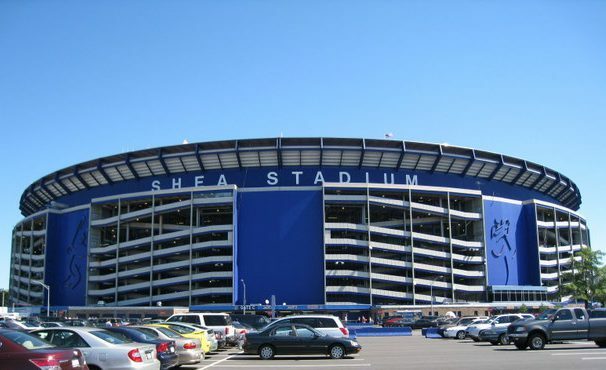 And so, I’ll get on with why we’re all here: we now begin, without further ado, the presentation of the first annual Shea Bridge Report Awards. First, an honorable mention to a player who failed to garner any other award, but only because this year featured so many other worthy candidates. This honorable mention goes to second baseman, Bronx native, un-drafted free agent, T.J. Rivera. It can’t be easy to come up from Vegas, where anyone — as evidence, see Eric Campbell — can bat .350, and start hitting against big league pitchers, but my word, did T.J. Rivera do it. It’s not even the .333 average that’s so impressive: it’s the way you get confident when he steps up to the plate. It’s the confidence you get as you watch that he’s about to hit a line drive somewhere. And it’s the feeling of hope that we might just have a legitimate offensive player here. Of course, Rivera’s biggest moment of the season was his home run off Mark Melancon, on an 0-2 pitch, to put us ahead of the Nationals in the top of the 10th after a Familia blown save. It was the kind of moment that makes a hero. And it’s the kind of moment that deserves a mention, if nothing else. On, then, to the David Wright Rookie of the Year award. The award is so named for two reasons; one, that David Wright was a rookie himself the first year I really started following the Mets, and two, that presumably, David Wright will never himself be eligible for the award, making it a safe bet on both counts. And while a few worthwhile candidates presented themselves, the choice has been pretty clear for weeks now. The 2016 Shea Bridge Report David Wright Rookies of the Year are Seth Lugo and Robert Gsellman. 5-2, 2.67. 4-2, 2.42. I won’t choose one, because both were so instrumental that they seem just about equal. But either way, it’s just about as clear to me as anything can be that if not for the performances of these two former nobodies, we would never have done as well as we did. First we lost Harvey, then Matz, then deGrom. Somewhere in there we heard that Wheeler wouldn’t be back either. So, we improvised. We had Thor and Bartolo. After that, who knew? Well we did, and now we do. Out with the assertions that we don’t have the pitching depth we need. Out with the critiques of our farm system. And in with the pitchers that, combined, in the home stretch, went 9-4 with a 2.58 E.R.A. Those out-of-nowhere stars are the kind of players that make championships. Lugo and Gsvllman didn’t quite take us that far. But they certainly did all they could. And speaking of out of nowhere stars, the next award, the Jose Valentin Award for Overachievement, honors those who do exactly that: come out of nowhere to step up, seize the reigns, and power the Mets to a second straight postseason appearance. We had many, many overachievers in our midst this year, among them the two rookies of the year. But once again, two players stood out. The 2016 winners of the Jose Valentin Award for Overachievement: Asdrubal Cabrera and Bartolo Colón. It’s hard to imagine the season without either of them: Cabrera playing 141 games despite his knee barely holding itself together the last month of the season, and Colón, winning 15 games, and to boot, hitting a freakin’ home run. First, Cabrera: this was, make no mistake, a career year. At age 30, against a career triple slash of .269/.329/.419, Cabrera hit .280/.336/.474, for an .810 OPS, the highest of his career. His 23 home runs were his highest total since 2011. His defense was solid. He introduced the platinum blonde craze that seemed to get everything going. His bat flip after walking us off against the Phillies, of course, is already the stuff of legend. And again, he did much of this on a knee that could barely hold his weight. And then there’s Bartolo. Aside from being the only pitcher on the staff to make every start of the year on schedule, there was the way he did it: the rotundity, the jocularity, and, of course, the surprising success. 15-8, 3.43 E.R.A., 3.4 WAR, a good outing almost every time out. And then, of course, the home run. Bartolo Colón hitting a home run may be the highlight of the season, 27-13 run be damned. Bartolo Colón hitting a home run is the essence of baseball; it’s why we’re all here. It’s unpredictable, completely earth-shattering, and, of course, more fun than anything that I can possibly think of. Lugo and Gsellman came in midseason, and helped us out. Bartolo and Cabrera did it all year. Our next award, however, goes to another player whose contributions began in midseason. This is the award for potential — the award for giving fans a glance, sometimes in an unfortunately literal sense, of what we might see a few years from now. I call it the Future Baseball Hero award. And the winner of the 2016 Future Baseball Hero award is our very own Brandon Nimmo. From Nimmo’s first game in the bigs, we noticed something: he couldn’t seem to stop smiling. He smiled when he approached the plate, whenever the camera was on him in the dugout, as he turned first after a single — almost always. Right then and there, he put himself in the running for an award. Everyone loves a smile. But it’s more than the smile, although I won’t deny the significance of the smile’s contribution: it’s the way he plays. It’s his sweet lefty swing. It’s his intimidating presence in the box, and the way he wears a uniform to look like a ballplayer. To sum up his qualifications for this award, it’s the way he makes it clear, each and every day, how much he loves the game. What does it take to be a baseball hero? In the simplest terms, it takes two things: the skills and the attitude. Well young Brandon, if my eye is any judge, has the skills, and as for the attitude, that much has been clear for a while. Brandon Nimmo is a Met in the making. To see his potential come to fruition is just one of many reasons I’m as excited as ever for 2017. These are all great, just like the players themselves: a playoff team can’t get by with 25 number-ones on the roster. But you’ve got to have one. Much consideration went into the selection of the first annual Shea Bridge Report Met of the Year. The competition fluctuated; all kinds of players were in contention, from Michael Conforto, running near the front of the pack after April, to Yoenis Cespedes, to Steven Matz, and, for a few solid days, to David Wright himself. But after all of that, this award sorted itself out fairly easily. There can only be one Met of the Year — and this year, there was one, in the greatest sense of the word. Your 2016 Shea Bridge Report Met of the Year: Noah Syndergaard. Syndergaard, the man they call Thor, started the year by throwing six scoreless innings while striking out nine, all to get us a win in Kansas City. In his second start, he went seven innings; allowed one run; struck out twelve. The start after that: 7 IP, 1 ER, 8 K. Every start, it seemed, was six innings plus, ten strikeouts plus, maybe a few runs, although not usually. All kind of stats can be rattled off to express the sheer greatness of Thor’s year. 10.7 strikeouts per nine innings. 158 ERA+. A FIP 31 points lower than his E.R.A. (for comparison, Madison Bumgarner had a FIP 50 points HIGHER than his E.R.A., and Max Scherzer’s FIP was 30 points higher than his E.R.A.). Eleven home runs allowed all season: the league leader in home runs per nine innings (a mere 0.5). a 14-9 record; a 2.60 E.R.A. All manor of more obscure accolades…“He’s the first pitcher in the modern era to throw however many innings with so many strikeouts and so few walks.” I don’t remember the numbers. They’re damn impressive. Then there was his start in the wildcard game. It was one of the biggest games of his life, and Noah threw the game of his life. He’s working on a postseason résumé that may well be every bit as impressive as Madison Bumgarner’s, one day: in five postseason appearances, he’s 2-1 with a 2.42 E.R.A., and averages 12.5 strikeouts per nine innings. In the wildcard game, which was almost certainly the biggest game of his career, he was as good as he’s ever been. And finally, look at his offensive numbers. Even putting aside the two home runs in Dodger Stadium, which have gone a long way in cementing his image as a veritable behemoth of an opponent, look at his slash from this past season. .190/.277/.397, a .673 OPS. Sure, he’s no Ted Williams — but look at the gap between average and OBP. an 87 point gap, which came down to seven walks in 67 plate appearances. And each component of that triple slash, by the way, is superior to Madison Bumgarner’s. But for a Met of the Year, it can’t be just numbers. With Noah Syndergaard, it wasn’t. You could feel the energy in the park when he pitched — the foam hammers waving in the air as THOOOOOOOOOOOOOR delivered one bullet after another, culminating, if he got the strikeout, with lightning flashing across the scoreboards and a jolt of energy blasting through the crowd. If Lugo, Gsellman, and Bartolo were our dependable rotation, Thor was the little something extra — Thor provided the swagger and confidence we needed to first sprint away with the wildcard, and then to walk into a game against the greatest postseason pitcher of the age with supreme confidence. It may not have worked out. But it sure was fun to believe we were going to win. And it sure was a welcome change to actually have a shot. The 2016 Mets were one of the most complex and interesting teams any of us had ever seen, so honors for seven players don’t come at all close to doing justice to their accomplishments. If I had the time, and an uncanny sense of irony, I’d honor everyone — from Kevin Plawecki, for his remarkable consistency in grounding out to third, to Gabriel Ynoa, for his innovative facial hair. But that’s not the point. The point is that this team wasn’t about one player or the other, but about how each player present, no matter how out of place or overmatched, could work towards an ultimate goal. Although some helped more than others, everybody certainly contributed. I award the players I’ve chosen because they exemplified something — whether hard work, common decency, or what it really means to be a New York Met. But really, they’re all Mets. They’re all our guys. Whether awarded or not, they all worked as hard as they could to get to where we ended up, and wanted it just as much as we did. There should be an award for that. There isn’t. But it’s something to keep in mind. When T.J. Rivera’s fly ball settled into Denard Span’s glove and our season officially ended, I remained sitting, barely moving at all in my chair, watching the Giants celebrate on our field. I didn’t know what to do, or what to think, or whether to say anything. I just didn’t know. It’s tempting, of course, to start throwing blame, and I did some of that: blame for the loss rests equally on Jeurys Familia and the fact that we were missing our starting catcher, first baseman, second baseman, third baseman, and left fielder. The point I’m trying to get at, of course, is that that we got this far is nothing short of a miracle. But I can’t stay down on this team. Even now, sitting alone, wondering how the hell I’m going to fill the time until mid-February comes and baseball begins to return, I can’t hate this team. Hate the result. Don’t hate the players. Really, how can you hate this team? Seth Lugo and Robert Gsellman, T.J. Rivera being the kind of player it’s impossible not to love, Asdrubal having a career year…everyone. Grandy coming out of nowhere the last few weeks of the season to hit 30 home runs. Neil Walker being the kind of offensive second baseman we’ve always wanted but never had. Addison Reed shutting down the opposition with ease, and Familia, with only slightly less of it. Jerry Blevins getting all the lefties, Reyes returning home and being a real, true, leadoff hitter, Cespedes bashing like Cespedes does, and hell, even Jay Bruce getting hot the last week of the season and hitting 30 home runs of his own. And Noah Syndergaard, of course, striking fear into the hearts of opponents. So, I guess, it’s time for all the usual end-of-season rituals; choosing the Met of the year, devoting an unusually high amount of time to thinking about David Wright, following free agent news and counting down the days; World Series, then it’s only a few weeks to Winter Meetings, then you get to New Year’s, and then suddenly, whoa, it’s only a few weeks to Spring Training. And getting to Spring Training is great, and even better is getting to Opening Day. They’re not as good as playoff baseball, but right now, they’re what we have. Happiness will come, and eventually we’ll look back on 2016 and remember the great moments that filled it. Asdrubal’s walk-off, obviously, and Cespedes’ walk-off homer as well. All the great games that Thor threw, Bartolo homering, Familia setting a new club record for saves that looks pretty much untouchable — although, that must be somewhat mitigated by the fact that the previous record-holder was Armando Benitez. Steven Matz starting 7-1, 2.34. Michael Conforto batting .365 in April. All the moments — we’ll look back, and we’ll remember what a season it was to live through. But not today. The story of 2016, I assume, will be roughly this: we were 60-62, then we went 27-13. Now THAT was fun to go through. It was all fun. It’s always fun. Even today, I can tell you without a second of consideration that Mets fandom, beyond anything else, is fun. Today wasn’t fun. But sooner or later, one day in the not-too-distant future, it will be again. Even if we’d won, our season would have ended in a week, or at most, a month. And undoubtedly, I would have been happier with that result than this one. But a day or two later, the same realization would have set in: there’s no more baseball. It may be better to go out on a win than a loss, but the real downside isn’t the loss, but having to go out at all that way. Right now, it seems as if baseball’s ultimate cruelty lies in its unpredictability and sudden twists and turns, especially when they go against you. And right now, that may be true. But that’s not the real cruelty of baseball, in a much larger sense. Baseball is cruel because it must end. Today, we realize that more than ever. Baseball is cruel because no matter how badly or how well a season ends, you can’t play ball anymore once it does. Why, on an October afternoon that could have passed for late summer if you didn’t realize quite how cold it was, was I thinking about the Winter? I wasn’t sure myself. Obviously, it was Closing Day, which will tend to make fans like me — and if you’re a fan like me, you know what I’m saying — somewhat reflective. What feels like it started — I can’t repeat this enough — just yesterday, is coming to an end for a good few months. It really is the beginning of winter: playoffs, or whatever part of them we’re able to participate in, notwithstanding, there’s not much difference between late October and early January. Either way, it’s almost certainly too cold for baseball. So I suppose it pays to be ready for winter, or, more accurately for my case, excited for a cliched version of winter, and conveniently forgetful of the less pleasant aspects of the season until they confront me sometime in December and force me to shove my hands in my pockets and curse the wind and the snow. But I guess that in looking towards winter, I was hedging my bets. So I did; I thought about Winter. I thought about light snows and green and red lights and Christmas music everywhere, walking the streets of New York and everyone being happy, ice skating and hot chocolate and heavy winter jackets that make you feel like you’re not even outdoors. Knicks games, Rangers games, football out in the snow, walking down to 84th and 3rd to buy a Christmas Tree and lugging it back to the apartment, wearing gloves so your hands don’t get covered in tree bark and sap. It’s not quite baseball season, or more accurately, it’s nowhere near, but it’s not all bad. But it wasn’t Winter yet: we still had a game to play, and at least one more after that, but if we’re honest, that’s hardly anything. April through August or early September is the best part of baseball season, when you can turn off a game regardless of the result and look forward to another chance tomorrow. We don’t have that anymore, but postseason baseball certainly isn’t nothing. But meanwhile, we had a game to play, but even more than that, a game to watch. I didn’t care how we played it; I don’t think anyone really did. We clinched a playoff spot yesterday: today was just one more day for send-offs. Sending off the regular season. Sending off the Phillies, whose promise to ruin our season came up just a bit short, and Ryan Howard, who may have ruined years past for us, but not this one. Sending off Gary and Keith, who won’t broadcast the postseason because life is unfair that way, and sending off Ron, who wasn’t in the booth but was there in spirit. Of course, there was one send off that wasn’t even in Philadelphia today, but may have been preeminent among all of them: in San Francisco, Vin Scully called his last game. Vin Scully has been broadcasting baseball since 1950, or, in other words, since before so many things that seem inconceivable. Vin Scully has been calling Dodgers games since before my grandparents had ever met; since before the Interstate Highway system; since before rock ’n’ roll existed; since Billy Joel was born. Vin Scully has been around forever: for the longest time, it seemed like that would be true for the future as well as the past and the present. Well, it’s not, after today: as of around 3:00 p.m. Pacific Time, after a blowout loss for the Dodgers and a parting message that only Vin Scully could deliver, Vin left the booth. That sendoff wasn’t as tough for me as I imagine it was for others. The twelve year old kid in Los Angeles who falls asleep with the Dodgers on the radio hidden under the pillow; the middle-aged fans who’ve listened to no one but Vin Scully; the 70 year old guy in Brooklyn who remembers when Vin was just starting out before Walter O’Malley went and ruined everything. I’m none of those; I’m just a fan. A Mets fan, to be exact, which made sending the September 2016 Mets off into memory was what I was focused on. And even in a loss, there sure were some things to take away. There was Kevin Plawecki doubling after what must have been about thirty four consecutive ground-outs to third. There was Matt Reynolds, whose early 2016 debut had satisfied my two or three year desire to see him play in the bigs, hitting a Texas double down the line, and De Aza driving him in. De Aza? I didn’t know he could hit. Boy, things have changed. And then there was the completely meaningless play that, to me, was the highlight of the day: Brandon Nimmo coming to bat as a pinch-hitter in the top of the ninth and singling. We left him at second two batters later; it affected the outcome of the game not one bit. But it stuck in my mind. Brandon Nimmo just looks like a ballplayer. In the tighter than average pants, reminiscent of the 90’s and early 2000’s, with the crew cut, the wrist bands, and the tight lefty swing, that kid’s going to hit. We’ve got a player on our hands: sometimes, you can just tell. He’s got all the tools, and he’s got the demeanor as well. Brandon Nimmo, it seems, is making his case for future favorite player. But I’ll deal with that when we get there. For now, we had more immediate concerns to deal with. We lost, our regular season ended, and the three-day, heart pounding wait commenced. In the meantime, I listened to the end of Vin Scully’s call of the Dodgers and Giants, then scrolled through each game in progress, listening until each ended, then moving on to another. We’ve got postseason baseball coming up, but the regular season is a whole different animal. The regular season is where fans are made. Only during the regular season can you flip from one game to another, mindless of who’s playing or whether they need to win, worried only about listening, one play after another, as a game takes shape. So that’s what I did. One more day of pure, fun baseball; then the furious race to the finish begins. Who am I to waste this last opportunity? There are only so many games left that we’ll play; indeed, maybe just one. Even if the season turns out better than any Mets season anyone has ever been a part of, after today, we’ll play no more than 21 games. And if that should happen, we’ll be happier than we’ve ever been, but even then, it will be bittersweet. Baseball is unfair that way. No matter how well a season ends, you can’t play anymore once it does. So, load up on baseball while you can, which is to say, I did while I could, which ended a few minutes after the Mets lost. And that was it for the regular season. The next time we’ll hit that pleasant, relaxing rhythm of hey, we’ve got another game tomorrow, isn’t for six months. No matter how long you put that eternity off, it begins eventually, and better to have those few more memories of the season to look back on when it does. But eventually you realize, as I did when I was 17 or 18, that the winter will pass — faster and faster each year, it seems — and Spring Training will start, and before you know it it’s Opening Day, and a team that looks mighty familiar to the one you last saw a few months ago is playing games again. And you want to ask yourself whether it can really be a whole new season since it feels like this very same team was playing only yesterday, but you don’t ask, because you know there’s no real explanation. You simply content yourself with knowing that once again, it’s baseball season, and if it’s not, then soon, it will be. So farewell, so long, and off into that great unknown that is postseason baseball with you. We’ll be there every step of the way, and when those steps stop and real, true winter sets in, we’ll be there still. And even as one season ends, whatever should happen when the postseason commences, soon enough, it will be all too clear that Opening Day is once again right around the corner. For me, the 2016 season started on a cold, dark Sunday night, the last day of March, with a reminder of how painful the end of 2015 had been. We were down 4-0. We cut it to 4-3. Wade Davis, who had ended the 2015 season in our opponents’ favor, came in. We had a man on third. He didn’t come home. But we won the next game, and the next. That Friday, our home opener, we beat up on the Phillies. It looked so easy — deGrom on the mound, everyone hitting, the blowout bullpen sealing the deal. And I’ll admit it: right then, I thought the season was ours for the taking. Clearly it wasn’t, as the intervening months would attest. I was at the next game, a 1-0 loss to the Phillies in 40-degree weather. I was at the one after that, another loss to the Phillies, although Cespedes finally homered. And then we started winning. Then we started losing. It wasn’t the romp to the division that I’d expected. But it wasn’t terrible either. We reached what was probably our low point around the middle of August. Right around the same time, I realized that I didn’t think we were going anywhere. I was so sure about this that I wrote about it. As we continued winning and losing and not really getting anywhere, I wasn’t the only one feeling this way. “The Mets season could effectively end in St. Louis this weekend,” Adam Rubin wrote on twitter. Apparently, it wasn’t just me that had forgotten. But as these Mets are prone to remind you when things look tough, ya just gotta believe. Besides being inherently wrong, seeing as the season ends after game 162 whether you’ve got 100 wins or 100 losses, this turned out not to be even superficially true. After that low point, we started losing people. Matz, deGrom, Walker, Wheeler. Wright was already done. Duda hadn’t played since April. Niese came back for a game and then went down with something or other. d’Arnaud was bad. Conforto was in the minors. Granderson could barely hit. Neither could Jay Bruce. Loney had stopped hitting. Nothing was working. And yet, somehow, right around that time was also when we started winning. I mean really, how many different stories were there to keep track of? The return of Jose Reyes. Bartolo Colón looking maybe 4/7 of his 43 years old. Asdrubal Cabrera spending two months as Honus Wagner. Seth Lugo throwing what was, by spin rate, the dirtiest curveball in the league. Granderson suddenly starting to hit, and reaching 30 home runs; Cespedes reaching 30 as well. T.J. Rivera batting .340. Brandon Nimmo having the biggest smile in the world and a swing that’s gotta be up there as well. I don’t know how or why it worked. I don’t know whether we can keep it up. I just don’t know. But what we’ve done is already just about enough. At least nominally, it’s a playoff appearance, as opposed to a game 163. I’ll accept that. Whether we win or lose — and obviously, I’d like us to win — we’ll have defied the odds beyond belief. Beyond belief, whether we’re talking strictly emotional belief or statistical likelihood — on August 19th, our playoff odds were 6.7% — that’s almost 15:1. 42 days later, they’re 100%. Talk about beating the odds — if what I understand about sports betting is correct, if you’d put $100 down on us to make the playoffs on August 19th, you could now walk away with almost $1500. If happiness were cash, right now, I could come up with that much and then some. So what do we do now? We go on, and we play tomorrow, and we play Wednesday, and when we win, we play until we can’t play anymore. We play until we’ve got postseason highlights to remember and new enemies to curse and a new pennant to hang up at Citi Field. It’s not like last year, or at least, not yet: we’ve only got one game to look towards, for now. Wednesday night, at home, everything on the line. So for now, that’s where everything lies. Hope for the rest of the postseason, closure on a wildly successful season regardless, determination of whatever else will happen on this ridiculous ride. After that, we keep going. Or we’re done. Either way, we’ve done one hell of a job. So for now, we just enjoy it. We enjoy Closing Day against the Phillies, we enjoy Monday and Tuesday as the tension builds until we just can’t stand it, and we enjoy Wednesday, as our heart rates increase slowly and we watch what will inevitably turn into an instant classic. And after Wednesday, things calm down a little bit either way. But we’ll worry about that when we get there. Your 2016 Mets, ladies and gentlemen. They were down, but as today will attest, most certainly not out. Now we’ll just have to see where they take us from here.